SAM-e Gold is a clean-label SAM-e product that is standardized to the biologically active S,S isomer, is shelf-stable, free of potentially harmful additives, certified vegan, certified kosher, and verified non-GMO through supply chain verification and PCR testing. SAM-e Gold is manufactured in the USA to industry-defining quality standards and is verified by independent third-party labs to meet identity, purity, and potency label claims. S-Adenosylmethionine is a naturally occurring, sulphur-containing compound synthesized from L-methionine (an amino acid) and ATP (a compound used to make cellular energy). It is one of the most active methyl donors produced in the human body, is an indirect precursor to glutathione, and is involved in more than one hundred biochemical pathways and processes. SAM-e supports positive mood, strong cognitive function, and helps keep the liver and joints healthy. SAM-e Gold features the biologically active S,S form, which is the form that mediates biochemical activity in the human body. The SAM-e used in SAM-e Gold is processed using a patented process that yields > 70% of the active pure S,S form. Because SAM-e is inherently unstable and can be degraded by stomach acids, most commercially available brands include a number of preservatives and stabilizers (e.g. methacrylic acid copolymer, glyceryl behenate, magnesium silicate, triethyl citrate, titanium dioxide, mannitol, glycerol palmitostearate, silicon dioxide, medium chain triglycerides, sodium carboxymethyl starch) to protect the active ingredient and to support shelf-stability. However, NutriGold is philosophically opposed to the use of synthetic and potentially-harmful additives. 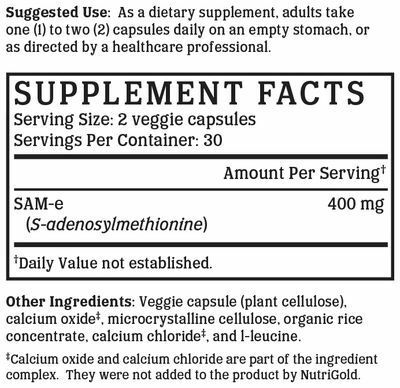 So, we spent over 2 years in R&D to formulate a SAM-e product that does not require enteric coating, can be encapsulated in a veggie capsule instead of requiring tableting, and is free of many of the synthetically processed additives and preservatives used in most commercially available SAM-e supplements. Vegan Action has offered vegan certification since 1995. Their official seal is proof that SAM-e Gold does not contain ingredients derived from animals or animal by-products, is free of animal-derived GMOs or genes, and is not the subject of ongoing animal testing. Most consumers consider kosher products to be cleaner, healthier, or better than non-kosher products. The Ko Kosher symbol on SAM-e Gold is assurance of our brand's unwavering and uncompromising commitment to accountability, quality, and overall safety. We like to make supplements that can be enjoyed by everyone. That's why our products are always compliant with the best practices for avoiding allergens and minimizing cross-contamination. SAM-e Gold is free of soy, gluten, egg, milk, peanut, shellfish, and corn allergens. Consistent with our guiding principle to “do no harm,” SAM-e Gold is manufactured without the use of additives or preservatives. It contains absolutely NO contaminants, pesticides, herbicides, harmful additives, residual solvents, magnesium stearate, or hexanes. Like all NutriGold products, SAM-e Gold is subject to over 140 purity and potency assays by independent, third-party labs to ensure that the product meets or exceeds its claims. So, you can be certain that what's on the label is what's in the bottle. Nothing more, nothing less. No articles featuring SAM-e Gold have been published yet.